If you have noticed an unusual amount of third-party web content while surfing the web, it could mean that your computer is in connection with a suspicious adware server. One such server goes by the name of Notblocked.biz. In the majority of cases seeing ads, pop-ups, coupons, or other invasive web content powered by this devious server is an indication that a questionable application is active on your personal computer. It goes without saying that such undesirable functionality can make surfing the web a much more annoying and bothersome task than you are used to. In other instances, content coming from this devious server might prove to be quite dangerous and in consequence could be the primary reason suspicious programs might be able to enter your operating system without a lot of trouble. To learn more about Notblocked.biz and why we recommend breaking any connections liked to it make sure to read the rest of our report. As mentioned earlier undesirable content coming from Notblocked.biz server is a strong indication that a suspicious program is already active on your PC. In most cases, connectivity to it is prompted by various adware programs. Thus, we highly advise you to check your PC for any ad-supported program if you already see ads, pop-ups, and coupons powered by the server in question. While it is less likely connectivity to the devious server could also be established by a browser hijacker. Often such connection is set up with the help of a devious third-party browser extension. Therefore, it is a good idea to see if your browser is not running any questionable plug-ins. It goes without saying that having a system in constant contact with an adware server is not a pleasant experience. That is so because for as long as there is a connection to it, your web browser will be filled with a huge amount of undesirable content, whether you like it or not. No ads, pop-ups, or coupons are useful in any kind of way. In fact, sometimes due to the amount of such intrusive content surfing the web could become a virtually impossible task. In severe cases, your web browser might simply crash without any warning. It goes without saying that you must disconnect your operating system from Notblocked.biz once and for all. This is the only way that you will be able to surf the web without any interruptions once again. Unfortunately, ads and pop-ups of Notblocked.biz could be just as dangerous as they are annoying; therefore, we highly advise you to refrain yourself from clicking on any of them. Upon further investigation, our malware experts have discovered that some content could be implemented with redirect links that might lead you to suspicious and even potentially harmful sites. For example, by clicking on a seemingly harmless ad, you could end up on a website that hosts malicious software. Such web pages are usually crafted by malware developers to deliberately infect an unsuspecting user's computer. Cyber crooks are known to use an arbitrary code exploit as it allows a code to be run remotely. This means that just entering a website that runs this exploit could be more than enough to trigger a silent remote installation of some malicious application. In other cases, you could be redirected to fake online shops that are crafted by cyber criminals for a sole purpose of stealing your credit card data and otherwise sensitive information. It goes without saying that entering any of the aforementioned websites could have detrimental outcomes. Do not waste any time and break the connection to Notblocked.biz by deleting the program responsible for it. Use the instructions that we provide below with care. It is important not to skip any steps as the connectivity to Notblocked.biz might not be terminated. If you are still bothered by the intrusive web content while surfing the web, we advise you to double-check your computer for suspicious software. In case you find such analysis of your operating system a bit too complicated, make sure to scan your entire operating system with a reliable antimalware tool as it can detect and delete any devious application linked to Notblocked.biz in a fully automated manner. 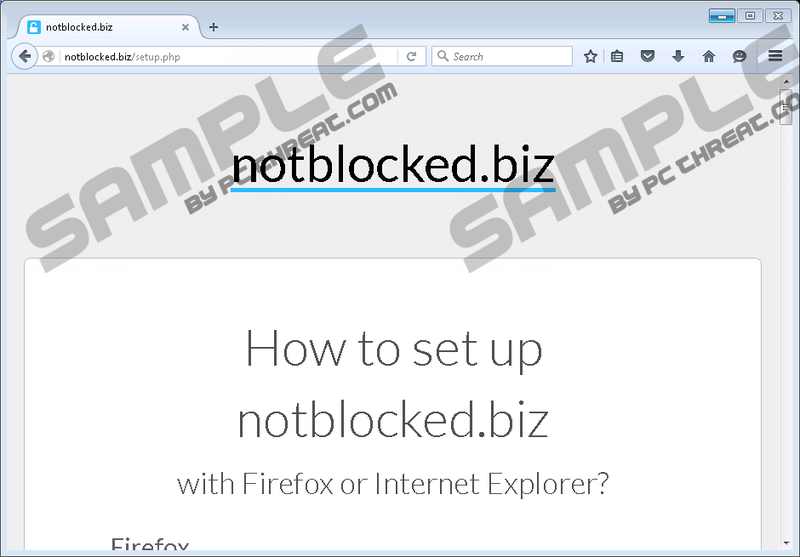 Quick & tested solution for Notblocked.biz removal.